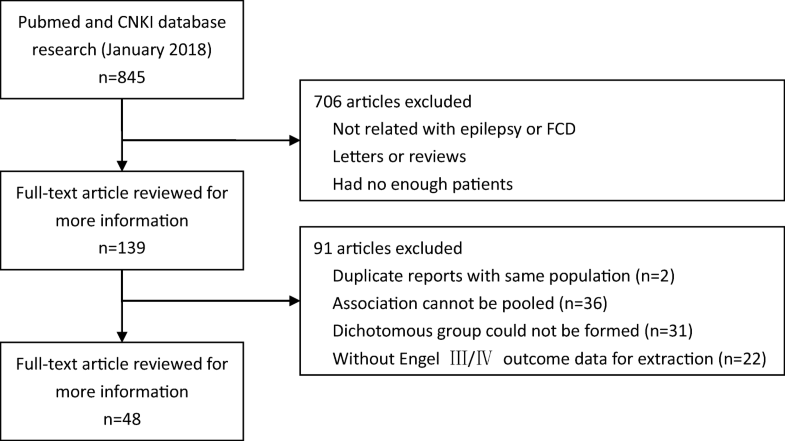 The aim of this study was to determine the predictors of seizure recurrence in surgery for focal cortical dysplasia (FCD) by conducting a meta-analysis. Publications that met the pre-stated inclusion criteria were selected from PubMed and CNKI databases. Two authors extracted data independently about prognostic factors, surgical outcome, and clinical characteristics of participants. A fixed-effects model was used to calculate the summary of odds ratio (OR) with 95% confidence interval (CI). Forty-eight studies were included in our meta-analysis. Three predictors of seizure recurrence (Engel class III/IV)—histological FCD type I, incomplete resection, and extratemporal location were determined; combined OR with 95% CI were 1.94 (95%CI 1.53–2.46), 12.06 (95%CI 7.32–19.88), and 1.91 (95%CI 1.06–3.44), respectively. Trial sequential analysis revealed that the outcomes had a sufficient sample size to reach firm conclusions. Furthermore, seizure location was not substantially modified by geographic region, while histological FCD type I and incomplete resection showed a significant association with seizure recurrence in different continents except Asia for incomplete resection. Sensitivity analyses restricted to studies for each variable yielded robust results. Little evidence of publication bias was observed. Meanwhile, the difference in the standard for outcome failed to influence the results for prognosis. Network meta-analysis including 13 trials comparing subtypes of FCD found the FCD IIb had the lowest seizure recurrence rate. This meta-analysis suggests that histological FCD type I, incomplete resection, and extratemporal location are recurrence factors in patients with epilepsy surgery for FCD. In addition, FCD IIb is associated with the highest rates of postoperative seizure control among the subtypes of FCD, type I and type II. Focal cortical dysplasia (FCD) has been recognized as a significant cause of intractable epilepsy. FCD may be amenable to surgery if the epileptogenic zone is localized . However, the prognostic factors of surgery for FCD are still not clear. Since Taylor et al. first described FCD in 1971 , there has been an increasing interest in this new malformation of cortical development. In recent years, many epidemiologic studies have been carried out to identify the predictors of surgical outcome for FCD. A series of studies reported that pathological feature, surgery procedure, and neuroimaging characteristics may be the potential predictors. However, the magnitudes of the association between predictors and surgical outcome varied in these studies, suggesting more comprehensive studies using a large cohort are required . Although a previous meta-analysis  reported some variables that are important for the surgical outcome of FCD, the authors focused only on seizure-free patients. Nevertheless, whether these factors affect the unfavorable clinical outcome is unknown. Limited meta-analysis has been conducted to identify predictor variables of seizure recurrence of surgery for FCD. In this study, we analyzed the epidemiological data by collecting published literature in the field of FCD surgery and perform a comprehensive meta-study to identify factors that can be used to predict seizure recurrence following FCD surgery. We attempted to report this meta-analysis according to the proposed Meta-analysis of Observational Studies in Epidemiology guidelines . 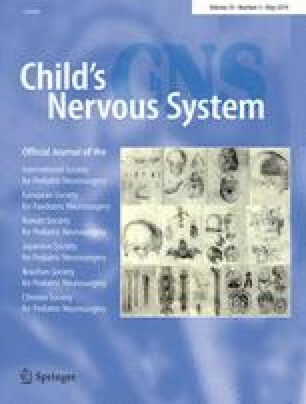 We conducted a systematic literature search of all the publications (earlier than 1/1/2018) from PubMed and CNKI (http://www.cnki.net/index.htm), using the keyword “surgery” in combination with “focal cortical dysplasia.” No restriction was imposed. When necessary, we contacted authors for permission and/or additional information. Studies were included if they met the following criteria: (1) patients had undergone surgery for epilepsy with a confirmed diagnosis of FCD; (2) surgical outcomes were described in accordance with Engel’s classification  or ILAE (International League Against Epilepsy) classification ; (3) since we defined seizure recurrence as Engel III/IV or outcome classification 3 to 6 in the ILAE classification system , predictor variables must be associated with Engel III/IV outcome (or ILAE OC3–6); (4) more than 10 surgical candidates in a single study and patients with dual pathology should be less than 20%; (5) original data in studies can be divided into dichotomous groups to compare. When the same population was used in more than one study, we selected the study that had the longest follow-up time. Due to the long span of time involved (1991–2018), FCD was classified by the Palmini system (2004) or ILAE system(2011) [9, 10]. In certain cases, “cortical dysgenesis,” “microdysgenesis,” and “cortical microdysplasia” were considered to be equal to “focal cortical dysplasia” when their description was mapped to the Palmini system. Meanwhile, acceptable alternate terms for FCD type I and FCD type II were “architectural FCD” and “cytoarchitectural FCD,” respectively. Moreover, completeness of seizure resection was estimated by neuroimaging. If the epileptogenic zone was located in both temporal and extratemporal lobe, we considered it as an extratemporal location. Standard collection form was performed to extract the following information: author name, publication year, study location and population, number of participants, Engel outcome scores, recurrence rate, and predictive factors. Two authors independently searched literature, selected studies, and extracted data. Any discrepancies were resolved by discussion. The Newcastle-Ottawa Scale (NOS) was used to assess the quality of observational studies . The quality of case controls was also assessed by three criteria: selection of case and controls (0–4 stars), comparability of cases and controls (0–2 stars), and ascertainment of exposure (0–3 stars). We calculated individual and pooled odds ratio with corresponding 95% confidence interval (95% CI) for each study. Heterogeneity of OR was estimated by Q statistic (P < 0.10 was considered statistically significant) . We also used I2 statistic to assess inconsistency between studies . If Q statistic resulted to P < 0.10 or I2 > 50%, a random-effects model was used for meta-analysis, or else we chose a fixed-effects model . Furthermore, we chose sensitivity analysis to estimate the influence of a single study on the overall effect size by omitting one study in each turn. To evaluate whether the present results had a sufficient sample size to reach firm conclusions , we performed trial sequential analysis (TSA) for the major outcomes. Prior to analysis, 5% risk of a type I error, 90% of power, the O’Brien-Fleming function and relative risk reduction based on low bias were preset, according to the required information size in the TSA analysis. 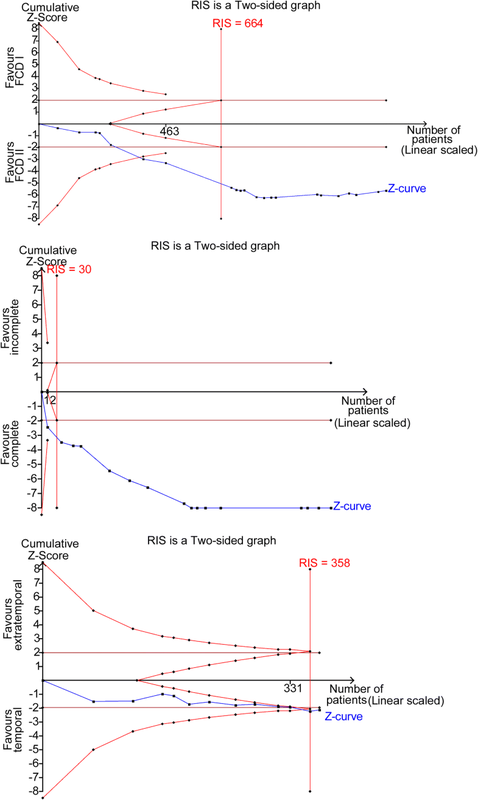 If the Z curve of cumulative meta-analysis crossed the monitoring boundary or required information size, a strong conclusion was deemed to be established and no further trials are required. TSA was conducted using TSA software version 0.9 (beta) (Copenhagen Trial Unit). Subgroup analysis was conducted to investigate the potential effect modification of geographic region on outcomes. All analyses were performed by using Review Manager Version 5.1.7 (provided by The Cochrane Collaboration, available at: http://www.cc-ims.net/revman) and STATA Version 11.0 (StataCorp, College Station, TX). A P value < 0.05 was considered to be statistically significant, unless being specifically stated in some cases. The Begg rank correlation test and Egger linear regression test were used to assess potential publication bias [16, 17]. If publication bias was evident, trim and fill methods were applied to provide an adjusted summary OR including the potential missing trials . Network meta-analysis was performed to compare different FCD subtypes in generating postoperative seizure recurrence using the network family of commands in Stata . The clinical data were first fitted into a consistency model, which assumes that treatment effects from direct and indirect comparisons are in agreement. To test for inconsistency, design × treatment interactions were added to the consistency model. 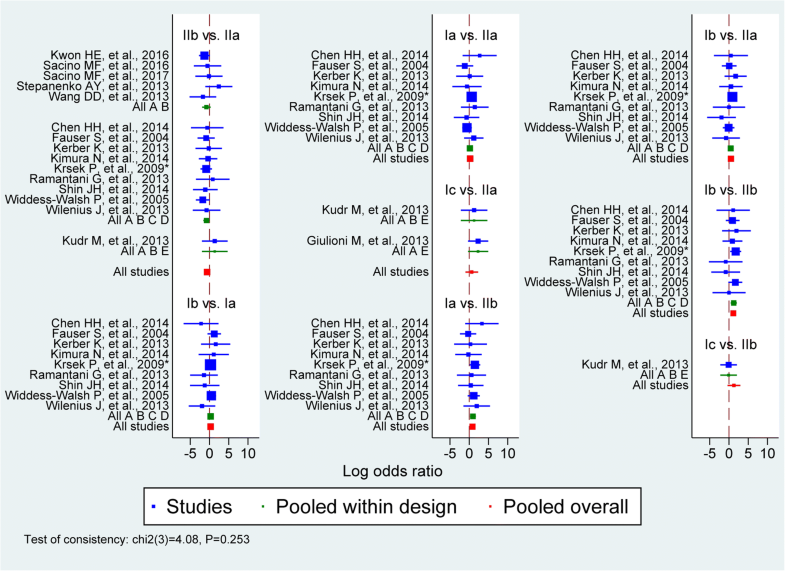 Forest plots were used to summarize study level and pooled treatment comparisons and comparison-adjusted funnel plots were used to assess publication bias . All analyses were conducted at the two-sided significance level of 0.05. We initially retrieved 845 potential citations from databases (817 in PubMed, 28 in CNKI). Based on abstracts and titles, a substantial number of publications were excluded after first screening because they were reviews, not relevant to our analysis or in the absence of enough participants. 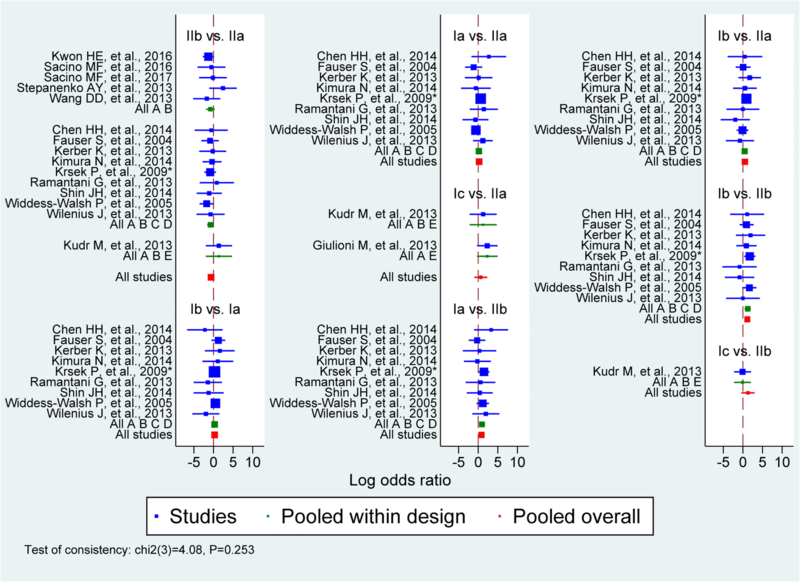 By full-text review of the rest 139 papers, 91 studies were excluded for reasons as follows: 2 studies were duplicate reports within the same population; 36 studies had estimated predictors, such as neuroimaging features, that cannot be pooled because they only had a small sample size; 31 studies used a non-dichotomous design to represent the association between predictors and outcome, where the OR of an individual study cannot be calculated; 22 studies had no exact Engel III/IV outcome data to extract. Finally, 48  studies met all criteria and were included [21, 22, 23, 24, 25, 26, 27, 28, 29, 30, 31, 32, 33, 34, 35, 36, 37, 38, 39, 40, 41, 42, 43, 44, 45, 46, 47, 48, 49, 50, 51, 52, 53, 54, 55, 56, 57, 58, 59, 60, 61, 62, 63, 64, 65, 66, 67, 68]. A flow chart of the study selection is shown in Fig. 1. The characteristics of the included studies are presented in Table 1. All the studies were published between 1991 and 2018. In these studies, 18 were conducted in Europe, 15 in North America, 14 in Asia, and 1 in South America. For most studies, the mean age at surgery ranged from 5.9 to 32.7 years. The sample size of the studies ranged from 11 to 240. The recurrence ratio ranged from 3.85 to 69.44%. Of the potential predictors in studies, we finally focused on 3 variables—histological FCD subtype, completeness of resection, and seizure location. Some studies included more than one variable. The majority of observational studies (66.67%) received more than 7 stars and were considered of acceptable quality according to the NOS tool (Table 2). 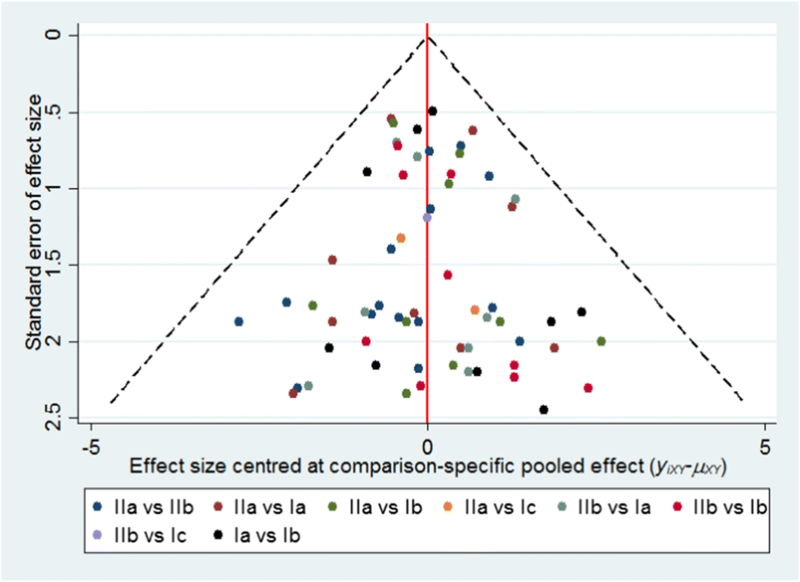 The effect size OR for each study and the combined OR for the three variables, including histological FCD subtype, seizure location, and completeness of resection, are shown in Fig. 2. There were positive associations of FCD subtype I, incomplete resection, and seizure location with seizure recurrence (ORFCD Type I = 1.94, 95%CI 1.53–2.46, P < 0.00001; ORincomplete resection = 12.06, 95%CI 7.32–19.88, P < 0.00001; ORextratemporal = 1.91, 95%CI 1.06–3.44, P = 0.03). No heterogeneity was observed in each comparison (histological FCD type: Pheterogeneity = 0.24, I2 = 14%; completeness of resection: Pheterogeneity = 0.68, I2 = 0%; seizure location: Pheterogeneity = 0.80, I2 = 0%, respectively). TSA revealed that the sample size of each outcome was enough to confirm the reliability of our conclusions (Fig. 3). Subgroups were defined based on geographic region. The 48 studies were divided into North America, South America, Europe, and Asia. Geographic distribution significantly affected the association between the FCD subtype, completeness of resection, and seizure recurrence, but we found FCD subtype was not related to the surgical outcome in Asia (OR = 1.24, 95%CI 0.75–2.04). Table 3 presented the results of subgroup analyses. Sensitivity analyses were conducted by sequential omission of individual studies. The combined ORs were not altered excessively by omitting any individual study. In addition, several researches applied seizure freedom to evaluate prognosis . We re-extracted the data according to the standard of seizure freedom and found no significant change in our conclusion (Fig. 4), which confirmed the robustness of the results. 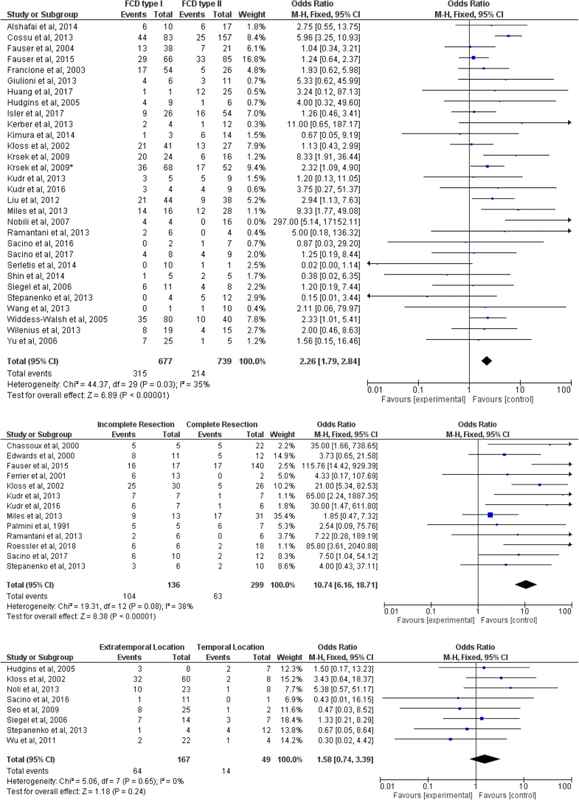 Among the identified studies, 16 trials were included in the network meta-analysis for the subtypes of FCD. Of these trials, 9 compared the FCD Ia, FCD Ib, FCD IIa, and FCD IIb; 5 compared FCD IIa with FCD IIb; 1 compared FCD Ic, FCD IIa, and FCD IIb; 1 compared FCD Ic with FCD IIa. No inconsistency was found in the network meta-analysis of FCD subtypes (χ23 = 4.08, P = 0.2529), and therefore the main conclusions were drawn from the consistency model. 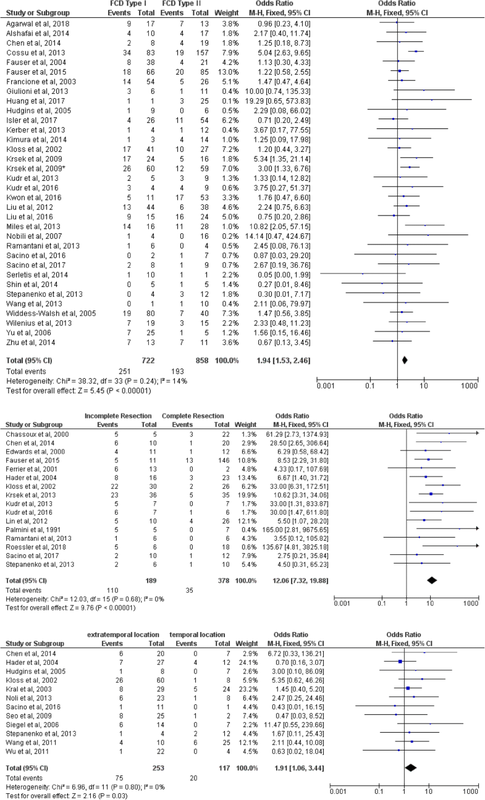 In the network meta-analysis and compared with FCD IIa, we found that FCD IIb was associated with a reduction in seizure recurrence (OR = 0.53, 95%CI 0.28–0.99, P = 0.048) (Fig. 5 and Table 4). There was a potential publication bias regarding histological FCD subtypes (Begg, P = 0.049; Egger, P = 0.499) and completeness of resection (Begg, P = 0.003; Egger, P = 0.032) related to seizure recurrence as suggested by the Begg rank correlation test and Egger linear regression test. No significant publication bias existed in the association between seizure location and surgical outcome (Begg, P = 0.244; Egger, P = 0.092). However, the pooled ORs of primary results were essentially unaltered by the trim and filled method, which implied that the publication bias had no significant effect on the major outcomes. Comparison-adjusted funnel plots for the network meta-analysis were shown in Fig. 6. There was no significance of asymmetry in the plot. In the past decade, the researches aiming to reveal predictors of surgery outcome for focal cortical dysplasia have greatly increased. Our meta-analysis of 48 studies determined three predictors associated with seizure recurrence, including FCD type I, incomplete resection, and extratemporal location. In addition, FCD IIb is associated with the highest rates of postoperative seizure control among the subtypes of FCD, type I and type II. There was no heterogeneity observed throughout our analyses. This observation can be explained by following facts: all of the studies used a retrospective case-control design; most of the researches were conducted in western countries, which means they shared similar population characteristics, diagnostic techniques, and surgical procedures; most surgical outcomes of the studies were estimated by the Engel classification system. The results of subgroup and sensitivity analyses were robust. Results of all subgroups supported our main analyses, except in subgroup analyses on seizure location. Compared to western countries, the association was significantly modified between FCD subtypes and Asia. It was possibly due to the small number of studies (10 studies were included in this subgroup). Also, the genetic background may significantly contribute to the geographical difference. It is worth mentioning that the ILAE Task Force developed a three-tier classification system for FCD in 2011 , and this nomenclature has been more extensively used in both the clinic and research in recent years. The major change of ILAE classification is the introduction of FCD type III, a new subtype which is in combination with hippocampal sclerosis (FCD IIIa), or with epilepsy-associated tumors (FCD IIIb). However, the studies included in the present meta-analysis were retrospective cohorts with a long-term enrollment period. Although some works were published recently, most of the enrolled patients were diagnosed as FCD before 2011 by means of the Palmini system. In viewing aforementioned facts, the present study focused on the classical subtypes of FCD, type I and type II. Several possible explanations were involved in the predictors we determined. Complete resection is essential to a successful surgery, as epileptogenicity of residual tissue will contribute to seizure recurrence after incomplete resection. Unfortunately, when abnormality is located in proximity to the eloquent region, complete resection is mostly impossible [24, 69]. According to the Palmini classification , FCD type I has cortical architecture abnormalities and FCD type II is connected with cytological abnormalities. Some studies suggested that malformation of FCD type I involves a potential extensive abnormal cortex at the microscopic level, which cannot be detected on MRI effectively and will finally result in incomplete surgical resection [70, 71, 72, 73]. These mechanisms are consistent with our finding. In our network meta-analysis, FCD IIb has better post-surgical outcomes than FCD IIa, which is in-line with previous studies . It has been reported that extratemporal lobe epilepsy was a predictor of poor prognosis , which was consistent with the present results. In our study, TSA also confirmed the reliability of the outcome. However, the reason for the risk of seizure recurrence in extratemporal lesions remains unclear, which needs further researches. Potential limitations should be acknowledged here. First, all the studies used were retrospective analyses, so the results are subjected to selection bias and recall bias. Second, most of the studies we selected from the database mainly cared about favorable clinical outcome. Although we contacted the authors to retrieve as much information as possible, some of them were not able to provide detailed surgical outcome data and we could not include these studies. Therefore, we applied TSA to the analysis and confirmed that the present outcomes had a sufficient sample size to reach solid conclusions. Third, some unmeasured factors may confound the true association when unadjusted data were used in original studies. Finally, there was great robustness of the pooled results which could further strengthen the reliability of results. Our meta-analysis also has some implications for future research. Over the last years, little studies focused on Engel III/IV outcome data of epilepsy surgery. Therefore, large-scale and randomized research should be performed to find out the predictors of seizure recurrence after surgery. Neuroimaging test is important to epilepsy patients by its merit in delineating the detailed extent of the lesion area. Thus, an investigation about neuroimaging predictors related to seizure recurrence is needed. While multivariable research is attracting attention, the correlation between variables should be given more attention, especially the predominant variables associated with recurrence. Furthermore, our finding will be useful in the perioperative period. Based on clinical diagnosis and identified predictors, clinical doctors are able to choose the surgery procedure, determine the nursing method, and design the dosage regimen effectively for those patients with a potential high recurrence rate. In conclusion, this meta-analysis determined three predictors, namely histological FCD type I, incomplete resection, and extratemporal location which can be used to assess the seizure recurrence in the surgery management of focal cortical dysplasia. In addition, FCD IIb is associated with the highest rates of postoperative seizure control among subtypes of FCD, type I and type II. This work was supported by grants from the National Natural Science Foundation of China (No. 81771217; No.81771394).